The Duquesne University Mylan School of Pharmacy has exchange agreements in place with several schools of pharmacy across the globe, including Daiichi University in Japan. 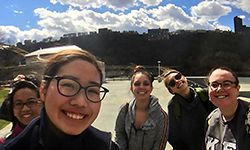 Student Diplomat Elizabeth Nguyen had the opportunity to spend a few days with a Daiichi student while a group visited Pittsburgh in March. That's Nana. She's a 20-year-old pharmacy student from Daiichi University in Japan. She loves shopping, watching American and French comedy movies, and reading books. The Duquesne University School of Pharmacy gave me the awesome opportunity to welcome her to Duquesne, and we exchanged emails back and forth for a month before I was able to meet her. It was incredibly exciting to speak to someone who was going through a pharmacy program like me, but half the world away and in a completely different language. I learned many things from her and I hope I was able to teach her something about American pharmacy as well. Nana takes the same sort of classes a freshman pharmacy student would take. She takes basic math, chemistry, physics, English and organic chemistry. She also takes a class called medicinal-use botany. She explained to me that a lot of Asians use medicinal herbs so pharmacists there have to learn about it, unlike here in the United States–that's probably why we have to learn a lot of heart medications. When I complained about organic chemistry being too hard, she wholeheartedly agreed with me, and I was kind of glad to know that organic chemistry was difficult in any language. Nana also explained to me that pharmacy school in Japan is only six years. It only takes six years for Duquesne students too, but that's an accelerated program. I was also really surprised to hear that to become a doctor or a dentist, it is also only six years of schooling. Medical school here is typically eight years and then even more schooling if you want to have a specialty. I asked Nana if there was something like that in Japan and she said there wasn't. From there she mentioned how her brother was going to medical school, and that he was, in her words, "a genius," and that she was not as smart as him. I remember looking at her with this sense of comradery, like "Girl, I totally get how you feel," because my brother is also planning on going to medical school, and I would also describe my brother as a genius too and that I was definitely not as book smart as him. She gave me this smile too and I just knew that from then on we would have a special "I might be the oldest, but my brother might be smarter than me" bond. The thing is though, it's still pretty impressive that Nana was brave enough to fly halfway across the world and hold her own in a different country that speaks a whole different language. So I think Nana and I have more street smarts and that's perfectly fine. Pharmacy is changing into a more clinical field, so while we have to know a lot of information, it's also really important for us to be able to communicate this knowledge to our patients. Sometimes we'll get patients who speak little to no English, and they still deserve quality care. If they don't understand us, then it's our job to get that information across to them. So honestly, if Nana could communicate with me with some of the English she knows and I could communicate with her with the no Japanese that I know, I think we'll be able to fit perfectly into this new world of pharmacy. In the end, I came away from this experience with more similarities than differences with Nana. I felt like I learned a lot from her, perspective wise. We aren't so different after all. I thought that most of the similarities would end at our pharmacy classes, but that ended up being one of the biggest differences. I'm glad that I was able to have this opportunity from Duquesne and Daiichi to speak with Nana and I hope that in the future I'll have many other pen pals as well.